; -On this page, we are documenting the frontline actions as well as major events happening regarding the EIS, the new administration's moves regarding DAPL, and moving and cleaning up the camps. 1/28/17 As Trump Reboots Pipeline Expansion, An Unexpected Delay Emerges in the #FrackedGas Empire On Thursday, Norman Bay, one of just three current members of the Federal Energy Regulatory Commission (FERC), said he would resign effective Feb. 3, even though his term isn't up until next year. His announcement came shortly after Trump decided Bay's fellow commissioner, Cheryl LaFleur, would serve as the Commission's new chair. 1/23/17 White House Propaganda Officer of Alternative Facts Sean Spicer states that proceeding with DAPL is a priority for Agent Orange. 13:41 https://www.facebook.com/OcetiSakowinCamp/videos/1088950624583502/ SD State Legislature proposed resolution, and Harold Frazier of Cheyenne River Sioux Tribe - only three water districts (Mni Waste, Rosebud, and (unclear) ) and one municipality (City of Dupris) supports #NoDAPL fight. 1/18/17 4 major legal updates today! Read more: http://bit.ly/2iTUfEU In District Court today, Judge Boasberg denied DAPL’s request for a Temporary Restraining Order to stop the EIS process from going forward! Also today, the US Army Corps officially filed their intent to prepare the EIS - but only on Lake Oahe. 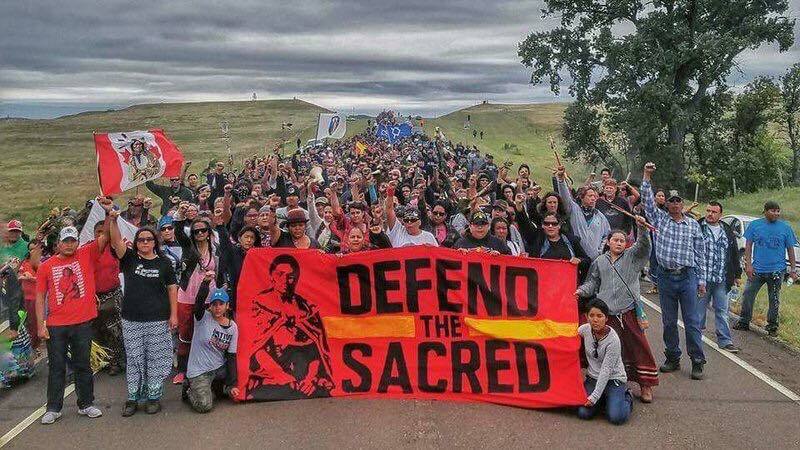 What we need is a FULL Environmental Impact Statement that assesses the risk for the entire length of the Dakota Access Pipeline, and the millions of people a rupture would endanger! 1/18/16 Backwater Bridge - Police getting bolder - Why is the bridge not open? NEW 1/18/17 Violent clash on backwater bridge - Angela Ohmer 14:54. 1/17/17 Backwater Bridge Again - Standing for opening of the bridge - Why is the bridge not open? 1/17/17-1/18/17 (early morning) - Julian Rodriguez Jr.
Waniya Locke - posted ~7am PT - near Mandan, ND - "Two nights ago, I went to the bridge to help with crowd control. I was dusted by this substance. It was a typical eyes burning, lungs burning, but afterwards about 30 minutes later. My body contoured and cramped up. I was like that for the rest of the night. It was not until in the morning, I was talking to my fellow water protectors did I discovered we all had the same experience... We think it is a nerve vine, to make us stop." 1/16/17 Backwater Bridge at Night - Why is the bridge not open? On Monday (1/16/17) night, a Morton County Sheriff’s Department snowmobile operator hit a water protector at high speeds. Our medics witnessed the impact, saw the police drive over the water protector, and saw the victim lay immobile on the ground. The extent of the injuries are unknown as our medics were not allowed to give this person medical care. When we approached the police line to offer aid, the police began to advance and fire on the crowd. We remain very concerned about this person’s health status. These reckless and aggressive police actions follow a pattern of violence that Morton County Sheriff's Department is employing. We are alarmed that this could be a new precedent if HB1203, which protects drivers who “accidentally” hit or kill pedestrians, advances in the North Dakota state legislature. We ask that you keep this unidentified water protector in your thoughts and prayers, and we ask you to remain vigilant in your support of the hundreds who remain in camp. We are so grateful for all of the amazing Water Protectors who have come to stand with the Lakota and Dakota people. NEW 1/16/17 Tear gas, prayers, water protectors, and police on 1806 - 16:23 shared by Jon Eagle SR.
NEW 1/16/17 Oceti Sakowin camp on Backwater bridge- 4:21. 11/26/16 - 1/11/17 Youth Unity Journey for Sacred Waters - From Saskatchewan! 1/6/17 You've helped us before and now we are asking you to help once more. 01/06 Chase Iron eyes: "People are staying at the liberated zone, Oceti Oyate, Oceti Sakowin, AllNations. North of the cannonball river is our Treaty territory. We own it, it is unceded. We have a birthright to be here, to hunt, fish, provide as nations do. It is going to flood so a relocation from low to high ground within the liberated zone is necessary. Some will leave. That is good. Most will stay because in our traditional dances you emulate the moves of a warrior: you can go forth, zigzag, and side to side if strategy is served but you cannot retreat. What would we retreat to? A life of indignity. We deserve our freedom, same as any other nation." 01/06 Chase Iron Eyes : "You must assert your Treaty rights, your inherent authorities. We deserve our freedom. We seek what all nations seek, liberation. Thank you brothers and sisters. For all of you out in the world. This is it. This is our time. Come if you can, self sufficient warriors." **Important clarification: This is not about closing camps!! This is relocation to safer space and clean-up. This is putting necessary attention on an impending logistical disaster, if not addressed right away. 1/3/17 Deans (Shiyé Bidzííl as most who watch his drone/live feeds know him) arraignment is today. More info as updated. Morton County Sheriff pointed an AR-15 at an Elder only carrying a pipe on a Prayer Walk! ​Video interview I did with the Elder who had the AR-15 pointed at him will be posted later tonight. 01/01 Chase Iron Eyes: "There is a sacred energy moving along all nations, all those continually evolving, getting woke & staying woke. It's the spirit of liberation. We are taking down Trump & all the fascism represented by the global corporate takeover of our right to determine our collective destiny. I know you feel it. Some fear it; we love it." 01/01 Descending the hill toward Oceti Oyate, Rosebud, Oceti Sakowin, Sacred Stone, AllNations Liberation Camps!!!! 01/01 Angelo Sison :Update from Sacred Stone, New Years, Dean (Shiye) has been Arrested, in custody until Tuesday.